This very interesting Laddie was distilled Sept. 2001 and bottled January 2014. A total of 492 bottles were filled from cask #326 (Oloroso). A first fill laddie is something I do not think I sampled recently, and It was my first Laddie from this bottler (The Maltman), so I really did not know what to expect (other than BIG sherry). Nose: Big sherry going on here, that’s for sure: marmalade sweetness, with quite a bit of wine effect, Meaty sherry, with sulphur galore (I like that profile, but some of you won’t). Seaweed, and salt too, and a wisp of smoke and a hint of cured meat mainly Prosciutto. Palate: Starts quite peppery and hot, with the wine tannins kicking in later, some red fruit marmalade, but certainly not as sweet as the nose, more dry sherry notes there. A hint of smoke, and leather as well as sulphur and spent matches, sea salt. thick and chewy. Finish: dry and lots of wine tannins, with some peat smoke and spices. This is indeed a very interesting little Laddie with a big sherry effect, meaty and sulphury. If you’re like myself, a fan of some sulphur to make things more interesting, than you’re going to love it, If you’re sensitive to that – better not rush and buy a bottle (more for me). 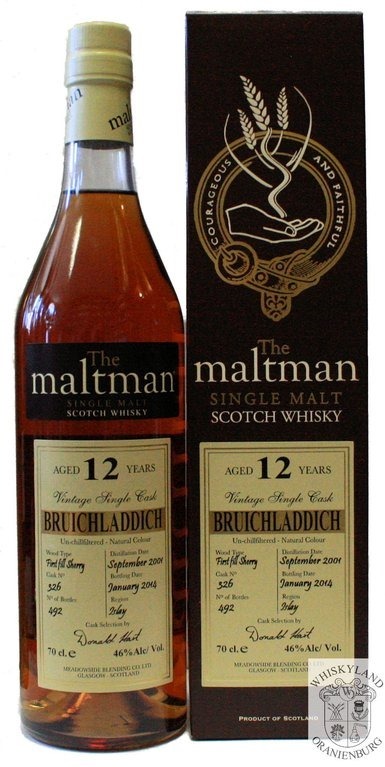 It’s quite tricky finding a bottle of this in the UK, as most of the MaltMan’s bottles are sold in the EU for some reason, but if you look well I am sure you can locate one online.